I love TV. Is that a sad admission? Maybe. But I think I do enough in life that I can say "I love TV" and not seem like a total loser. It was really easy for me to come up with my five favorite TV shows of all time. 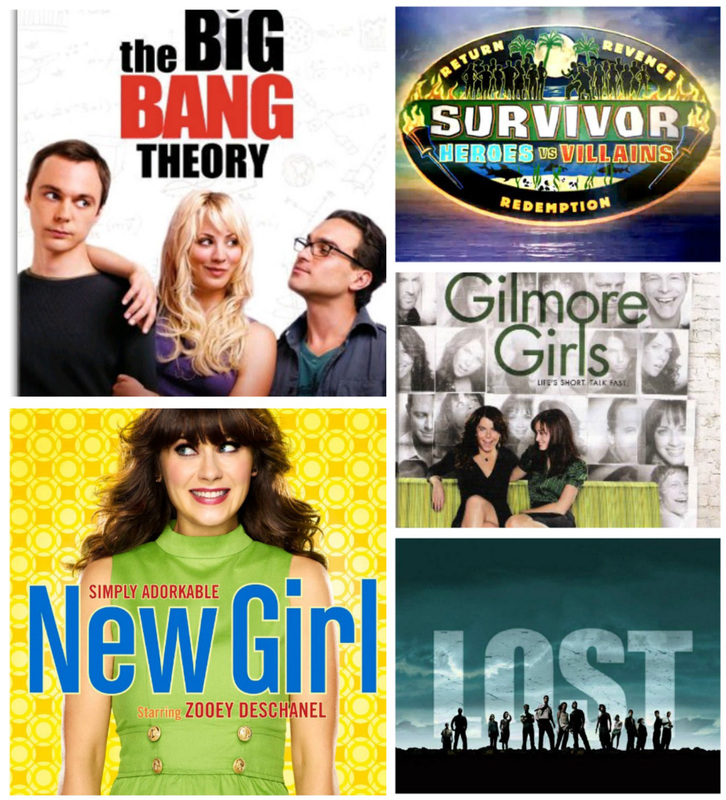 I thought of it this way: if I only got to have 5 TV series to watch for the rest of my life, what would make the cut? I've got adorkable comedy, I've got geek comedy, I've got reality TV, I've got sarcastic girl comedy, and I've got a drama that will make you think. Honorable mentions: Home Improvement, Mad Men, The Office, and probably a few others that I will be sad I didn't add to the list. Making this little list made me want to watch Gilmore Girls with my sister. Maybe I'll get out my old seasons and relive all the sarcastic and quick-witted goodness. I really wanna know - what are your favorite TV shows? The ones that would make the desert island cut? Of course it is a given that your desert island would have electricity and a television, in which case, send me now! I have not heard of Eli Stone... I will have to look into it. My husband likes House, but he hasn't kept up with it. Thanks for sharing your favs! I love those suggestions. Hmm...my desert island picks would have to include Scrubs. I've never watched Scrubs. Maybe I will have to watch some of the repeats next time I come across them. I have heard it's really funny. I guess we get most things a little later than you over in the UK, but we LOVE Big Bang Theory in our house, I watched Gilmore Girls to death when I was pregnant (both times...they show it during the day here. An outlet is a great way to think of it :) We also watch Desperate Housewives. Yes, my husband watches with me - haha! I am really interested to see how they are going to end the series. I L-O-V-E TV! There's no way I can pick my all-time favorites, so I'll share my 5 favorites that are currently on: Dexter, White Collar, True Blood, Modern Family, and The Big Bang Theory. My sister and I always talk about how we want to live in Stars Hollow! Friends is a classic - I should definitely have added that to my Honorable Mentions list! My fav: The Big Bang Theory (Amy Farrah Fowler rocks!!!! ), True Blood, Mad Men (I love you Don...) Modern Family. And Lost of course. Amy Farrah Fowler - hahaha! She is the best! I hear so much good stuff about Modern Family - I feel like I am missing something by not watching it. Thanks for sharing your favs! I love to watch Gilmore Girls with my sister and my mom, I have all the seasons but two...it's good to have on when I'm busy craftin' as well....But my new favorite that I CANNOT miss, is NEW GIRL!! I'm a big fan of Zooey Deschanel. Her quirkiness cracks me up! I also love her singing, if your interested you should check out her band 'She and Him'. They put out a Christmas album this year, it rocked! I have their Christmas album - it is great! So mellow. I am loving New Girl so much! I can't wait til it comes out so I can re-watch it!